Winnipeg's Departures may be one of the best kept secrets in the country right now, but with the release of their fantastic debut album, Still and Moving Lines, that's all about to change. Tucked onto a makeshift stage at the back of the Ace Art Gallery in downtown Winnipeg's Exchange District, the noisy post-rock five-piece, made up of close friends Nick Liang, Steve Kesselman, Graeme Wolfe, Rob Gardiner and Alannah Walker have a musical chemistry that can only come from the singular pursuit of creating engaging art, leaving the rest of the baggage of the music industry to work itself out. Right from the opening number "Pillars," singer/guitarist Liang's presence commanded attention, while drummer Gardiner (Greg MacPherson's band) hammered away at a powerful foundation that would be the bedrock of the more aggressive elements of the night. For a relatively young band, Departures seemed extremely comfortable shifting between drawn-out melodic moments and punctuated blasts of urgent, controlled noise, using those sonic bridges to tie a common thread through the ebbs and flows of the material on Still and Moving Lines. Transitioning to the repetitive synth undercarriage of "Winter Friend," the band explored a more constrained groove, while toning down the dense guitar work to give the song space to breathe. 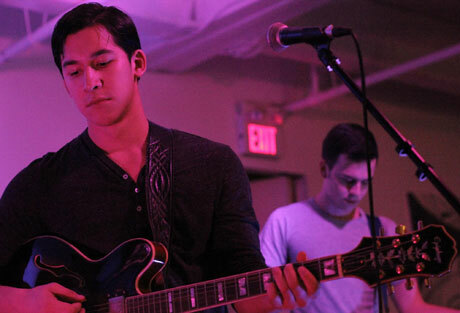 "Left You Here," featuring Walker's vocal and synth contributions, broke up the nearly hour-long set, with the Cannon Bros. member trading off singing duties with Liang throughout the song to add yet another layer to the band's sound. It's a shame that both Walker and Liang's vocals were blurry in the mix, making them difficult to understand at times. Finishing the night off with the shaggy guitars of "Contempt" and distortion-driven workout of "Being There," it was easy to hear why Departures may be one of the best up-and-coming bands to come out of the province in the last couple years.